There’s such a wealth of information about dieting and nutrition available online, it can be difficult to distinguish fad culture from solid, medical advice. Instagram is a haven for fitness gurus, self-proclaimed ‘food’ experts, and with thousands of followers their lifestyle is often imitated. "I have a healthy relationship with food. Eating 2000-3000 calories - I roughly estimate and always eat more than 2000 cal because I know I'll be hungry if I eat less. I eat healthy 70-80% of the time. Just remember: don't let numbers get you down and define you. Don't go on some silly starvation diet- it won't work in the long run." Let's talk food Left: October 2015 (11 weeks into BBG. weighing 54kg) Right: September 2016. (59 weeks into BBG. weighing 56-57kg). Ever since I started gaining fat, I thought it didn't matter what I ate as long as it was less than 1000 calories. This always ended up in me either going to bed with intense hunger pains or leading to me binge eating everything in sight and not stopping until I was in pain from fullness. This mindset was so messed up, I thought I would be happy if I ate less, weighed less and hit my goal weight of 50kg. But the less I ate the more unhappy I got with myself. I had no control over how I was eating because my body was constantly in starvation mode or too full to function. I was gaining weight from fat from all the junk food I was binging. 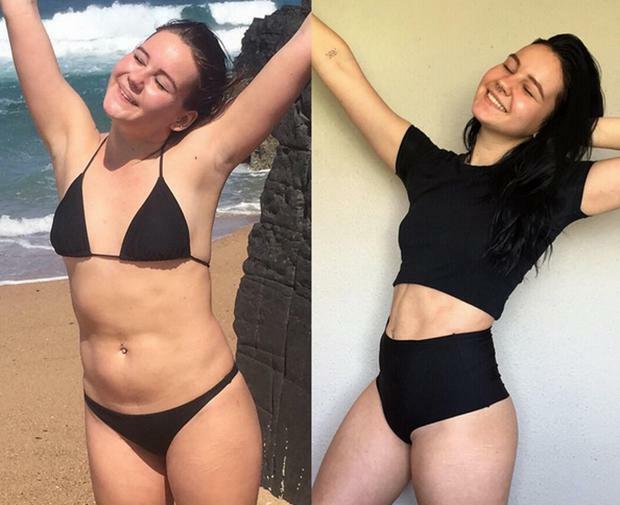 I was so devastated- I didn't understand why eating less wasn't working. I thought I wasn't strong because I couldn't go a few days without binging. In January 2016 I realised what I was doing wasn't working. I decided to go vegan and found out how eating <1500 calories is putting your body into starvation mode and is only a "quick fix" to losing weight and you'll eventually gain fat back by eating junk food since your body is lacking food and craves junk. I then started eating more and stopped using apps to count calories. It was hard but I knew if I just trusted my body it would work. Something had to work. I slowly had more energy and could push myself during workouts! I initially lost weight due to body fat and then gained weight due to gaining muscle. I now weigh around 56-57kg (6-7 kg above my goal weight). I'm not sure on exact weight because I don't weigh myself anymore, I don't let numbers dictate how I feel about myself anymore. I just go on how I feel mentally, and I feel amazing! I finally feel like I have a healthy relationship with food. Eating 2000-3000 calories- I roughly estimate and always eat more than 2000 cal because I know I'll be hungry if I eat less. I eat healthy 70-80% of the time. Just remember: don't let numbers get you down and define you. Don't go on some silly starvation diet- it won't work in the long run. Food is meant to fuel you, not make you upset. Puhto isn’t the only Instagram personality to have alternative views about nutrition and exercise. Earlier this week Jennifer Widerstrom posted two completely different pictures just two minutes apart. Puhto claims to consume between 2,000 and 3,000 calories. The recommended calorie intake according to the NHS is 2,000 for women and 2,500 for men. indy100 spoke to Dr Arun Ghosh, a private GP who is also the resident doctor for The Jeremy Kyle Show where he advises about nutrition. "There is some essence of good in macrobiotic diets [getting the right balance between carbohydrates, proteins and fats). 2,000 calories a day isn't just about having it from a cream cake. It’s about nutrient valued to what you do in your life. "For example, if you’re exercising, you do need carbohydrates and taking them out of your diet will do more harm than good." As a GP, what do you work towards in terms of nutrition? "[My work] dispels the myth that calories are interchangeable units – like 100 calories from wine and 100 calories from cabbage is the same thing. It’s not. "Where you source your calories from is more important than the amount of calories you’re taking. "If you’re eating lots of fruit and vegetables, it’s going to be much better [for your health] than eating fried chicken. "It’s about lifestyle choices, and not about watching the calories you eat. "If you get your fats from fish, avocado and you go over [the 2,000 or 2,500 recommended daily calorie intake], it’s still much healthier than getting fat from fried food and take away." the recommended daily amounts outdated? "It’s too rigid – it’s a good guideline, a general guideline – a little like BMI. But I wouldn’t go up to a rugby player and tell them they are fat. "There are huge variations. If you’re [eating] over the expected amount and you’re really active and getting calories from a good, balanced source, then you’re generally going to be okay. "Again, if you're [eating] below the expected amount but you're sedentary, and you're getting the calories from a balanced source, you're generally going to be okay. "People can often take this very rigidly. There are so many variations – men, women, pregnancy, and menopause. "Be proactive rather than reactionary. If you’re hungry, have a biscuit. If you’re not, don’t have a biscuit. "Food manufactures need to label their meals better, and we also need to be much healthier with our conception of food. "It’s not a diet; this is how you should be all your life. And if you want a bit of cake, have a bit of cake."